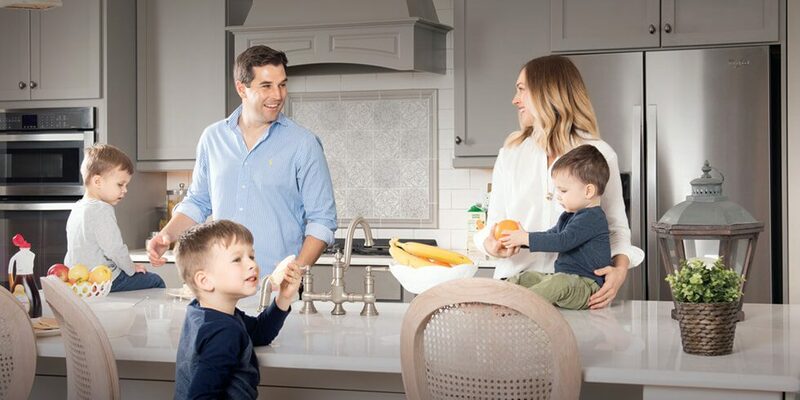 For most families, the kitchen is the heart of the home. It’s where you start and end your day, gather for meals, reconnect after a long day and enjoy the fruits of your labor. That’s why Shearwater’s home builders have cooked up some beautifully designed kitchens with premium features and spacious, functional floorplans. So, whether you’re a professional chef or professional takeout orderer, you can have the kitchen of your dreams. If energy efficiency makes you smile, then you’ll fall in love with kitchens by David Weekley Homes. David Weekley Homes’ EnergySaver™ homes are backed by the Environments for Living ® program’s heating and cooling energy usage guarantee. So, you won’t need to worry about cooking that Thanksgiving turkey for six hours straight, because your home is more likely to stay cool under pressure. Plus, opt for a gas stove instead of electric to save even more energy and monthly costs. It’s all about the details when it comes to kitchens by Lennar. Lennar’s Everything’s Included® approach means that every kitchen comes with stainless steel appliances, 42” cabinets with crown molding, an ENERGY STAR® dishwasher, and a large single-basin kitchen sink complete with a built-in sprayer that makes washing the dishes a breeze. Even quartz countertops are included, so you can have peace of mind knowing your counters are cleaner and more durable than granite. Kitchens by Richmond American Homes are deserving of a five-star chef. Every home has the option to upgrade to a gourmet kitchen complete with an extra-large five-burner stove and double oven. Coupled with a generous kitchen island for extra prepping space, you’ll have everything you need to host a lavish dinner party, feed a crowd during the holidays, or whip up an impressive date night meal. Upgrades come standard in kitchens by MasterCraft Builder Group. You’ll find high-end features like premium appliances, granite countertops, plenty of cabinetry with crown molding and a nine-foot kitchen range hood vented to the exterior to keep the kitchen cool. A spacious walk-in pantry and enormous California-style kitchen island means you’ll have space for everything from a quick breakfast before school to an elaborate spread of hors d’oeuvres for holiday parties. You’ll have space to spare in kitchens by D.S. Ware Homes. The majority of homes by D.S. Ware Homes include an extra-large walk-in pantry as well as a butler pantry. Or, available in some floor plans, swap out the butler pantry for a wine cellar with chiller, racks and iron grate so you have a special place for your collection. Tons of cabinet space means you can easily store all of your favorite kitchen gadgets, and a spacious kitchen island provides additional seating and prep space. If you’re a host at heart then a kitchen by Drees Homes might be the option for you. All homes by Drees Homes feature a centrally located kitchen that’s open to the living and dining area, making entertaining a breeze. Whip up some snacks while watching the big game in the living area, create a delicious masterpiece and easily transport it to the dining area or have a build-your-own-cupcake bar for your kid’s birthday! If you’re ready to find your dream kitchen, visit our community seven days a week to tour our fully furnished model homes. And join our Interest List and be among the first to receive news and updates about this new community.